Once upon a time, all the flashlights in our home were big and bulky and typically ran off of D cell batteries. They weren't even that bright. We've been slowly transitioning over to newer LED flashlights, the brighter the better. This latest one we got to try out is the C8 CREE T6 LED Handheld Flashlight from BYB. Brightness of flashlights, or any light for that matter, is measured in lumens. This one is 1,000 lumens. In other words, very bright. As a point of comparison, a 75 watt bulb is 1,100 lumens and a 60 watt bulb is 800 lumens, so we're right between the two, in a portable variety that you carry around in your hand in an emergency. The first thing you'll notice with the flashlight is it doesn't take disposable batteries. Instead, it comes with a rechargeable Li-ion battery. When you get the flashlight, take the 18650 at 2200mAh at 3.7v Li-ion battery out and make sure it is fully charged with the help of the included charger. Just twist off the back / where the on/off button is at base of handle to get the battery out. The plug on the charger flips out and the light on the charger indicates when fully charged. Don't lose the charger when you are done charging, as you'll need it for next time, even if the battery does last upwards of 10 hours of use. Once charged, you can have some fun. 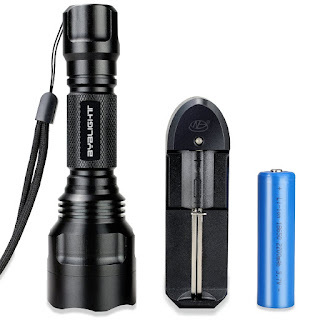 The flashlight has five different operating modes, High / Mid / Low brightness, strobe and an SOS signal (3 fast, 3 slow, 3 fast) Just tap the button lightly to go between modes. Weight-wise, with the battery, the flashlight checks in at just under 6 ounces / 165 g. I'm not saying it is heavy, but it feels heavier than it looks. Good balance. I hope to not need the feature but the flashlight is water resistant. I think of that as you can accidentally drop it in a bucket of water and you'll be okay but don't go scuba diving with it. The lanyard is optional to wrap around your wrist, or for hanging. Only thing I can complain about is the beam is fixed and you cannot adjust the cone based on your needs. If you need a wider flood light though, just fully take off the cover on front and you'll get one. The product itself is your basic bright, compact flashlight. It does its job well and the flashlight shouldn't disappoint. We can finally toss those old flashlights away that barely worked any more anyways, and when they did were about 1 / 10th the brightness. Before your chance to win one, this giveaway is part of a Giveaway Hop brought to you by The Kids Did It and The Mommy Island. Do stop by the other hosts on the hop and see what you can find interesting and available. And, now here's your chance to win one. The giveaway is open through 3/1/16 at 11:59pm EST. It is open to US residents who are 18+. Void where prohibited. The winner gets the flashlight pictured above with a list price of $49.99, though currently on sale for just $16.99. Genuine 18650 3.7v 2200mA, Premium energy efficient, Long Run-Time, lithium battery is what I like the most the lithium battery would last a really long time. I like that it's so bright! 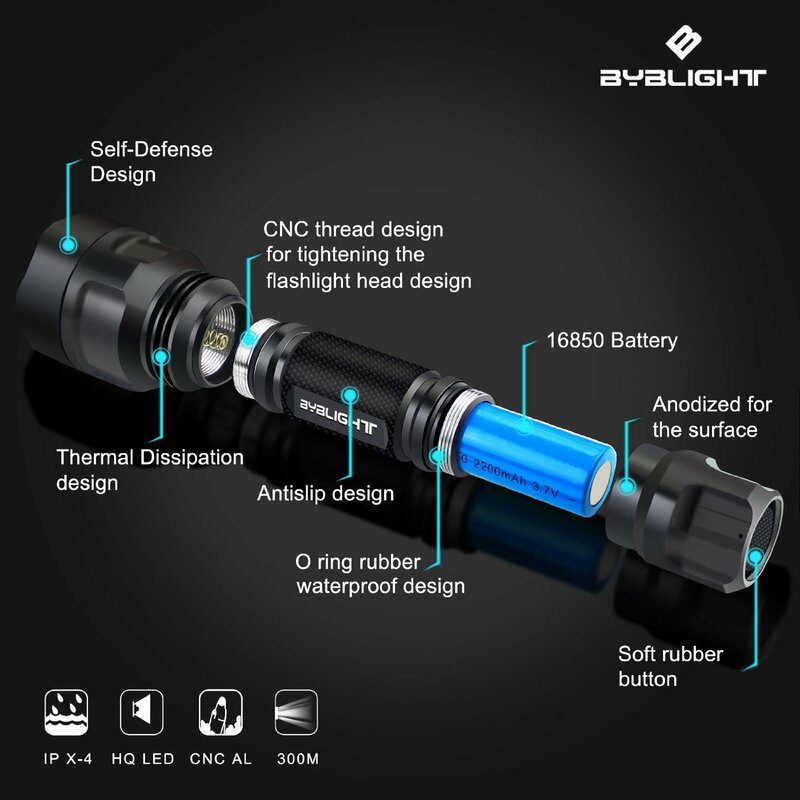 Toughened ultra-clear mineral glass with anti-reflective coating, brighter than other flashlight is the feature I love best! It's better than other flashlights that I own. I love the brightness because I can use it to light my way into my mom's house because she doesn't have a porch light and it is too hard to see my way out to the car in the evening. I like that it is long light life and brightness. I love how powerful this Flashlight is!! It is powerful enough to light up an entire space...we sure could use this in our dark backyard. My favorite feature is the anti-slip design. The feature I like the best is the Deluxe Cordless Rapid AC Charger part. My favorite feature of this cool flashlight is that you can choose the brightness depending on what you need, with High, Mid, and Low settings. That would be really useful. I love that it's rechargeable - I never remember to buy batteries. Since I'd use it in the pasture, I love that it's waterproof, too, since I have ankle deep mud 90% of the time out there. I like that it is water resistant for wet camping trips. I like Rechargeable 18650 Battery and AC Charger Included. It has a rechargeable battery. that is handy! I like that it uses a rechargeable battery. I love that it is rechargeable! I have never had a rechargeable flashlight! My favorite feature is that you can recharge it. I absolutely love that, having been left in the dark of a power failure with no batteries. I like the memory feature. I love that it's small AND rechargeable. It looks awesome. That it is rechargeable is a big plus. I like that it is very very bright too as I am legally blind. I need all the light I can get. I love that it's water resistant! Thanks for the chance to win. OK, I am going to admit I am a little behind the times, but none of our flashlights are LED. I like that feature. My favorite features of the flashlight is how bright it is, the fact that it's waterproof and the rechargeable battery. I really like that its water resistant. I like that it is water resistant and rechargeable battery. I really like Toughened ultra-clear mineral glass with anti-reflective coating, rechargeable, and IP-4 Water Resistant, Anti-abrasive, free-scratch, shock-proof. Okay, so I like everything about it! I like that it's water resistant. Being rechargeable and water resistent helps a great deal. I really like that its rechargeable. I never have working batteries in my flashlights when I need them. I like that it is brighter than other flashlights. I like that it is so bright. I like the Different settings feature. I love to have the light us bright when I'm trying to find something but If I'm just walking the dog I don't need to be waking up the neighbors by using the highest setting. Plus the SOS and Strobe settings might be useful if I ever get stranded in my car or hurt while I'm walking my pets. I like the multiple settings for the light. It would be handy out here in the country. I like that this flashlight has an ultra-bright beam and that it remembers the setting from one use to another. I really like that the battery is rechargable and it comes with a charger. I like that it has tough glass because I constantly dropped things and this is a great feature to have. I like the different operating modes & that it is water resistant. It is bright with 1000 Lumens ultral-bright beam. I love the fact that it's rechargeable!! I like that its water resistance. I like the memory feature where it remembers what setting you had it when you last turned it on and goes to that setting. I like that it uses rechargable batteries and that it's not super heavy and big. Would probably give it to one of my teenagers to carry in their car. I like it is water resistant and has a long battery life. I like the ultra-clear mineral glass with anti-reflective coating. I like that it has a rechargeable Li-ion battery. I love that it is shock proof! My favorite feature is that it is rechargeable. I like the brightness of the light and also that it is rechargeable. I like that it is rechargable. It is so hard to find goog quality rechargable flashlights. My favorite features are that it's water resistant and has enough lumens to be bright enough for my needs. my favorite feature of the flashlight is that it is water resistant. My favorite feature is that this awesome flashlight is water resistant. ★ Toughened ultra-clear mineral glass with anti-reflective coating, brighter than other flashlight is my favorite feature because I need this bad boy to last. My favorite feature is that it has a cordless ac charger. I really like that ita water resistant and rechargable. I love that it weighs in at just under 6 ounces / 165 g. !!! I love that you can recharge this flashlight! I never seem to be able to find regular batteries when I need them. This would be perfect! I love that this flashlight is rechargeable. I always need a flashlight and the batteries are dead. 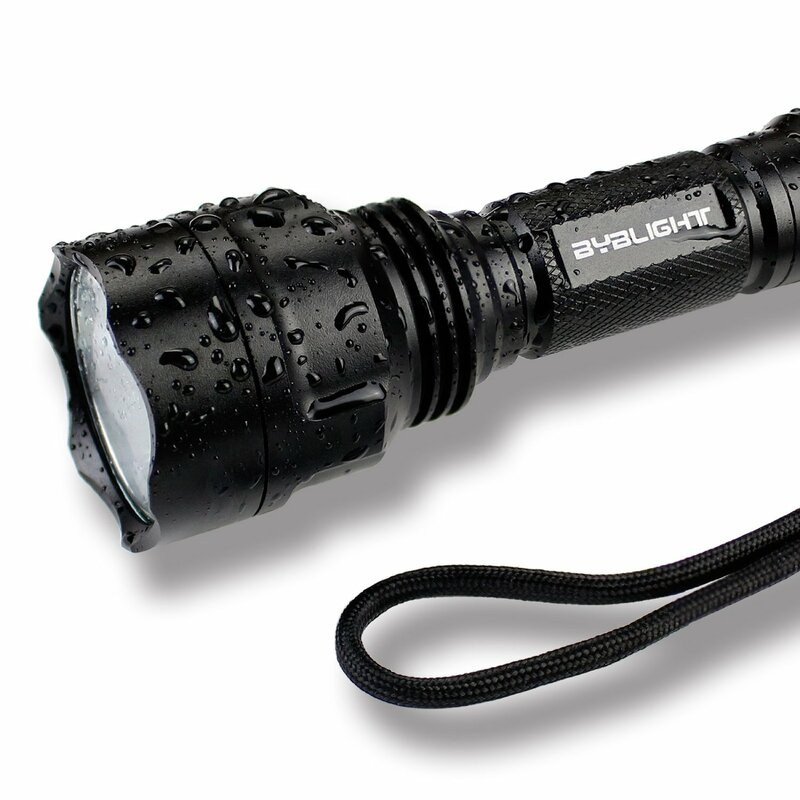 Favorite feature: it provides Max 1000 Lumens, a powerful ultra-bright beam. I like the rapid recharging and the waterproof design. I like that it comes with and uses rechargable batteries. I like the Deluxe Cordless Rapid AC Charger! My favorite feature of the BYB Flashlight is the Memory Feature in that it remembers the mode you were in the last time that you used it. I like that it has a long life span of approx 100000 Hours. 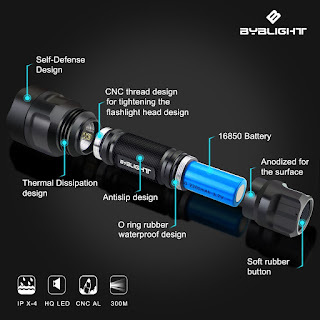 My favorite feature is the toughened ultra-clear mineral glass with anti-reflective coating, brighter than other flashlights. I like that it is rechargeable and comes with the recharger.